For all it’s worth, Chime Sharp looks like a zen-inspired puzzle game. The player is tasked with tessellating shapes together to form larger quadrilaterals, all to the tune of pulsing electronica. 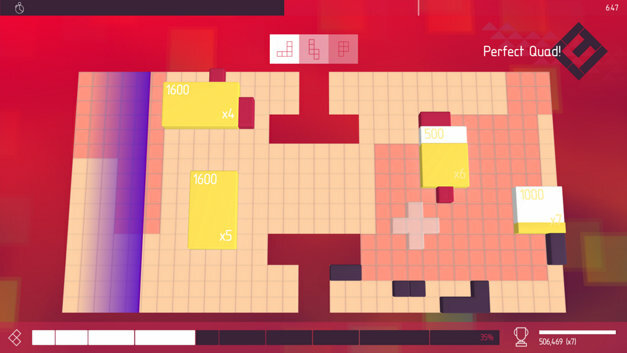 Don’t be fooled by its colourful, minimalistic exterior however, because this is a game sure to challenge even the veterans of the puzzle genre. Developed by Ste Curran as a followup to 2010’s Chime, Chime Sharp is a mesmerising experience which is a little stressful and a lot satisfying. 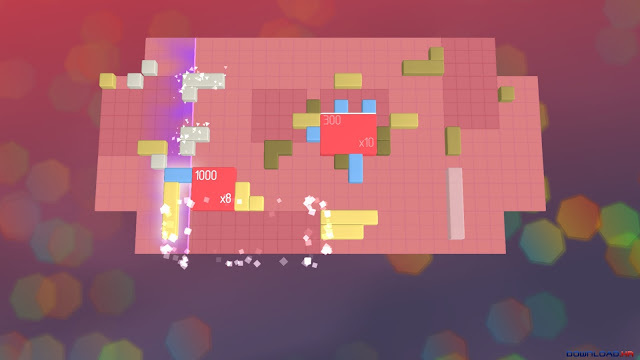 Chime Sharp’s standard game mode is an eclectic mashup of Tangrams and Tetris, requiring players to think quickly and find the perfect spot to place an endless array of shapes. Pieces may be placed at whichever rate the player desires, but they will be at the mercy of the beat-line which slides across the stage and erodes your pieces away. Once pieces are arrayed into at least a 3x3 sized quadrilateral, they will flash and disappear once touched by the beat-line, earning points and painting the squares beneath. Level progression is tied to the percentage of squares painted before time runs out, with a certain percentage required to unlock further songs and game modes. If that sounds a little confusing at first, don’t be dismayed. The actual game is quite simple, but the minimalist aesthetic featuring lots of differently coloured squares can be counterintuitive. In my early moments I longed for a better tutorial, not to tell me how to play, but to tell me how to play well. It’s hard to discern a good run from a bad run, it’s difficult to prioritise your shape placement and it’ll be confusing when sometimes the timer ticks to zero only for you to earn bonus time, and at other times the level unceremoniously ends. All of this needs to be figured out on your own; it’s not even easy to explain how the game’s various systems work, but once you understand you’ll be in for an immensely enjoyable experience. The game’s standard mode is a score attack based on how many quadrilaterals you can form before time runs out. Earning 60 per cent coverage on a standard level unlocks Sharp mode, which is a more methodical variant; in this mode, there’s no time limit but each time the beat-line erases a square, you’ll lose some health. Whereas Standard tests efficiency, Sharp is all about planning. The third mode is Strike which is a strict time attack, whereas the final Challenge mode warps the game board to ramp up the difficulty. 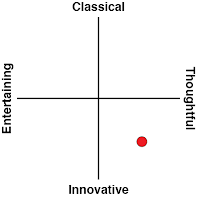 Each game mode has a distinctly different strategy to it, prolonging the life of the game’s 16 songs. Despite billing itself as a music-puzzle game, most players will be drawn to Chime for the puzzle aspect. The game’s levels are set to tracks from a variety of electronic artists such as CHVRCHES and Message to Bears, as well as some underground acts. The game’s board acts similarly to a synthesiser; the beat line triggers musical cues based on the blocks it encounters. It’s a feat of remarkably clever programming but I worry that this would be lost on most players, since the game’s music doesn’t affect the gameplay much. 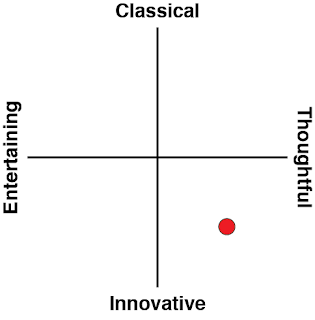 It does mean however that the soundtrack is always dynamic, becoming denser and more complex as the board fills up, and adapting to the pace of play. With four different game modes for each level, Chime Sharp might look like it’s lacking in content compared to other puzzle games on the PS4, but its frenetic, score-chasing speed lends well to its replayability. The score margins to unlock additional game modes are also tight, requiring masterful play in order for players to see everything. It’s a design choice which might be uncomfortable for those seeking a more casual experience, but for completionists and perfectionists, Chime Sharp will surely be a worthy adversary. Those seeking to prove themselves will also be glad to know there are online leaderboards for each song and mode. Related reading: The other great franchise that mixes music and puzzling together is, of course, Lumines. 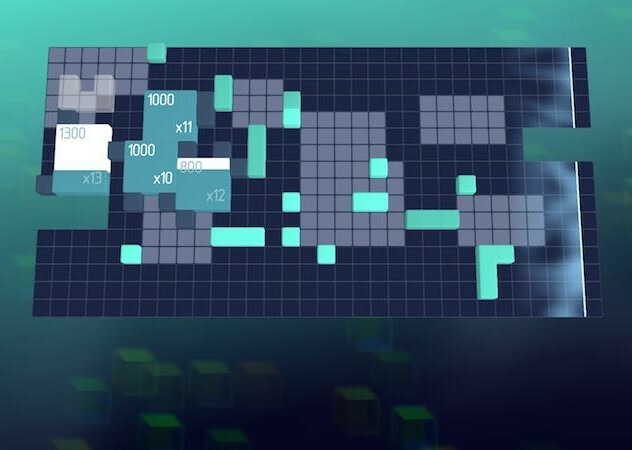 Matt reviews the PlayStation Vita Lumines title. With great music, satisfying gameplay and a lot of replay value, Chime Sharp is definitely a puzzler worth your time. It’s a colourful journey through a world of vibrant melodies, with a degree of challenge sure to test even the most seasoned of genre fans. Whether you’re looking for short bursts of play or an afternoon of high-score hunting, Chime Sharp is not to be missed.